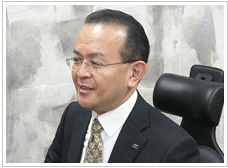 Profile of President | NEURON JAPAN Co., LTD.
Iwamoto Shinichi is the President of NEURON JAPAN CO.,LTD. since 2000. 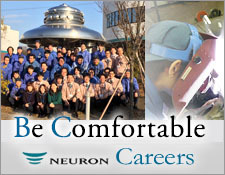 He joined NEURON in 1989 with his brother, who is now the Senior Managing Director, and had hands-on experience in manufacturing, welding, assembling, and designing division. Before joining this company, he worked for a CAD/CAM system group at a Japanese trading company and experienced handling machining center, plano-miller, wire-cutting machines, 5-axis LASER machines, and NC machines (3D/CAD-Operating and NC-Programing). I wish to live my life by rewarding benefits I received with respects toward peoples, believing my strong lucky and thanking to good bonds with love. I want to raise my Total Leadership in the relationships with all of people such as my family, company staffs, customers whom I met through business, especially my relatives. “鬼手” means “Demon’s hands”. “仏心” means “Buddha’s heart”. “Demon’s hand” is profit supreme management that secures strong competitiveness by a tough decision and a thorough rationalization strategy and aims to expand and improve profitability, and “Buddha heart” is important to the customer and employee’s human heart. It is human-oriented management. Seeing, however, the two are contradicting each other, I dare to say “Damon’s hand” should be prioritized than “Buddha”. I believe that the leader who cannot secure profits through the mission of sustainable prosperity of the company has no qualification to use “Buddha”. On the contrary, the ultimate goal of corporate activities is obviously “Buddha”, that should be the management based on fostering the people. With this philosophy I am convinced that management should be to strive the ultimate harmony for both polarities, and to realize the primitive happiness of the human beings for our customers and staffs. Fair evaluation on staffs all the more will end up the difference in their compensation. Also, it is more important NOT to overlook the good achievers rather than to miss the people who made mistake. It is not cooler than “Commitment and Engagement”, but I plunge me into “…have declared.”, then materialize it. Originally human beings are weak, not “good” or “evil”, I wish to take care trying to draw potential strength in the people.